Isbin T. Giddens and Matthew O. Giddens were the two youngest sons of Isbin Giddens, a pioneer settler of the Ray City, GA area. The Giddens brothers served together in the Civil War. They joined Levi J. Knight’s company of Berrien Minute Men, Company G, 29th Georgia Infantry at Milltown (nka Lakeland), GA. Neither men would survive the war. 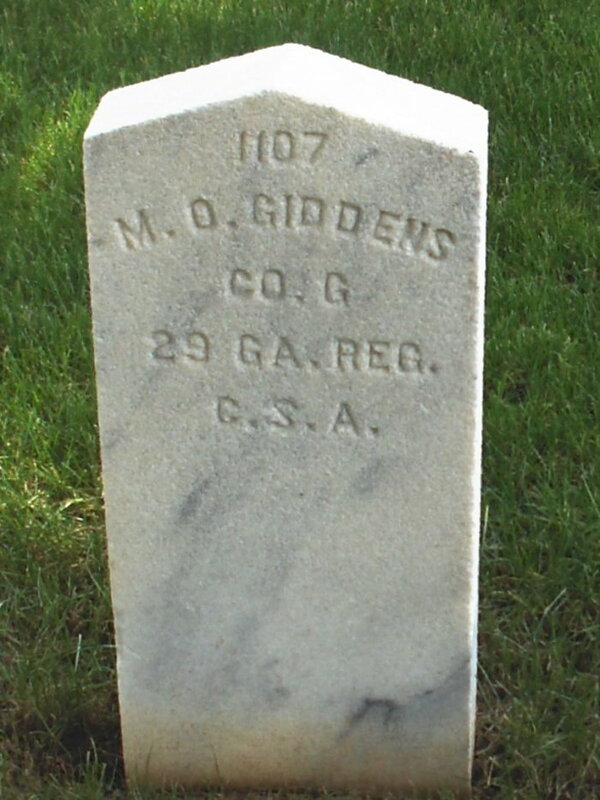 Mathew O. Giddens, a subject of previous posts (Matthew O. Giddens ~ Confederate POW), fought with the Berrien Minute Men for more than three years before he was taken prisoner on December 16, 1864 near Nashville, TN. He was imprisoned at Camp Chase, Ohio where he died three months later. Federal records of deaths of Confederate prisoners of war show that M. O. Giddens, 29th GA Infantry, died of pneumonia on February 7, 1865 at Camp Chase. He was buried in one of 2,260 confederate graves at Camp Chase Cemetery. The assignment to Guyton hospital perhaps gave the men a better than average chance of surviving his illness. In Surgical Memoirs of the War of the Rebellion, Volume 2, issued 1871, Guyton Hospital was described as one of the most effective of the general hospitals in Confederate Georgia. Patients at Guyton were far more likely to survive gunshot wounds or disease than soldiers sent to other Georgia hospitals. In May 1862 the Confederate Government established a General Hospital in Guyton, Georgia. This hospital was located on a nine acre tract of land between Central Railroad, a determining factor in locating hospitals, and current Georgia Highway 119, Lynn Bonds Avenue and Pine Street. The end of May saw five people on the medical staff at this hospital. Five months later the number had reached 46 people including surgeons, assistant surgeons, contract physicians, hospital stewards, ward masters, matrons, ward matrons, assistant matrons, nurses, cooks, and laundry workers. Covering for the Sick Soldiers. will answer, and we hope to receive a prompt response to the appeal, both from city and country. can for their comfort. All packages sent to this office will be promptly forwarded.